A team of researchers at Rutgers University, Camden (and one scientist from Turkey) took a look at these structures to figure out how they formed, and why they look the way they do. And why did they do that? The team looked specifically at medicinal leeches, which burrow in mud, form cocoons around themselves, lay their eggs, then leave the structure behind. But medicinal leech cocoons have that strange foamy mass on the outside, which other leech cocoons do not. The researchers looked at these cocoons under microscopes, and realized that the foamy structure probably formed as water evaporated, creating bubbles. They even tried making larger versions of the cocoons themselves: “Frozen peas were layered in a rectangular plastic dish and surrounded by plaster of paris,” according to the paper published in the Journal of Morphology last month. The solidified product looked similar to the hardened mucous bubbles. 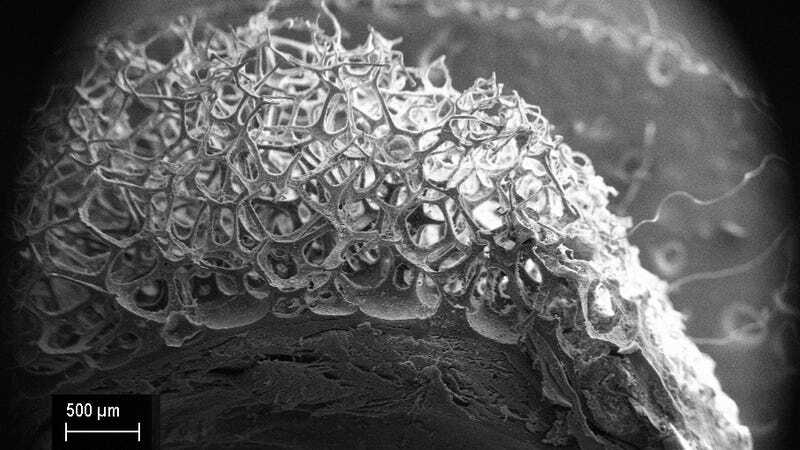 The scientists suggest that this unique structure probably helps the cocoon retain water, and the exterior spikes could keep the cocoon rooted in place. I’m writing about this because, well, nature can make some really weird stuff.